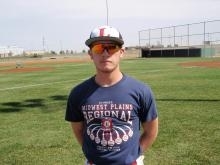 The Liberal Bulldogs took two over Guymon 11-0 and 4-0 at the Liberal Baseball Complex Wednesday night. In game one, Brandon Granger hit a grand slam and Travis Leverett pitched all five innings in just 53 pitches for the win. In game two, Leverett pitched the first two before Brandon Stokes tossed the last five shutout innings for the win. It was a scoreless game until the fourth when Austen Pitts and Jose Pondo both homered. Liberal is 21-5 and plays in an alumni game on Monday.